ScanDrop is a software available on Windows and Mac. ScanDrop lets you scan your documents to the cloud seamlessly. 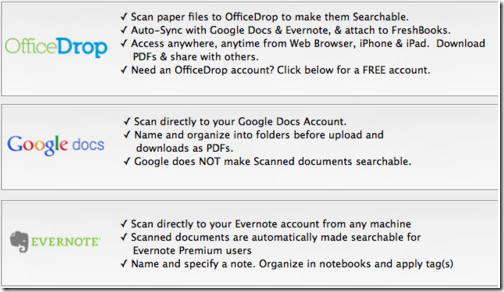 You can scan your important docs and send them directly to Google Docs or Evernote or ScanDrop’s own cloud service – OfficeDrop. ScanDrop is a freemium service. 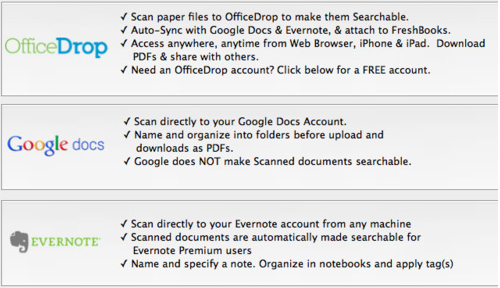 If you just want to scan your papers, photos to Google Docs or Evernote, you can do so for FREE. However, if you choose to using the OfficeDrop cloud service there are several plans to choose from. OfficeDrop lets you store your documents online and gives you access via web, iPhone and iPad just like Evernote. Plus, it makes the documents searchable. Google docs does not. The Mac software is set to be priced once it hits the Mac App Store. So, grab it for free if you have a Mac.